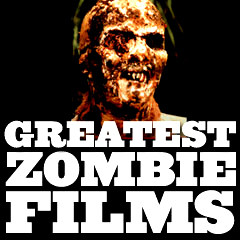 This feature tribute has selected a solid, representative sampling of the best (and most significant) in the sub-genre of zombie films, with a few that are very poor but laughable examples. They are all feature films (no made-for-TV movies, except for a few on-going series) from the 1930s origins to the present day. Zombies are 'walking dead' creatures, often with decayed flesh, that are destructive, malevolent, prey on human flesh, and are almost impossible to 'kill.' The word zombie was derived from the Bantu language of Angola (n-zumbi meaning ghost or departed spirit). They include zombies that were voodoo-created living slaves, to reanimated flesh-eating ghouls (the term used in Night of the Living Dead (1968)), to virus-diseased undead humans. Herein, it is documented how the modern zombie era was ushered in and has been going strong ever since, emphasizing unrelenting terror and assuring us that nothing would ever be the same again. Some of the earliest films in the horror genre were about the 'raising of the dead,' such as the Frankenstein films, and the early German expressionistic film The Cabinet of Dr. Caligari (1920, Germ.) featuring Caligari's somnambulist Cesare who rose from his coffin. It could be argued that the 'somnambulism' in the film was one of the earliest examples of a hypnotic, sleep-walking state similar to that exhibited by zombies. 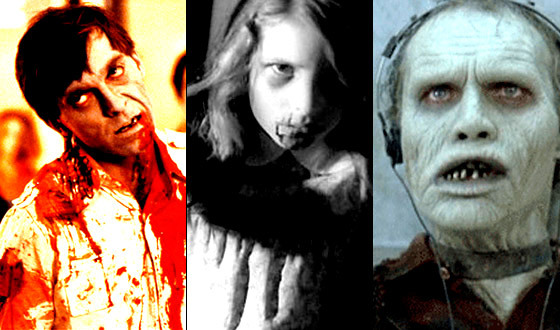 The subgenre of zombie films was unlike most horror characters and archetypes, which developed from written works. Zombies (involved in Haitian voodoo) debuted in one of the few American literary sources for zombie films - William Seabrook's 1929 tale The Magic Island. It was a best-selling book about sensationalist Haitian folklore which became a New York stage production. The lurid book detailed his adventures and encounters with the living dead — shambling hulks with unfocused eyes and expressionless faces. The zombie craze started with the Haitian concept of voudou, where a corpse was reanimated and magically controlled by a witch-like bokor (a type of priest, sorcerer, magician, or practitioner). The bokor would usually kill his/her victims or drug them, to simulate death, and then would bring the drugged or dead victims back to life, to serve as slave labor. In the early thirties, Hollywood was beginning to experiment with iconic-monster films, and it was only a matter of time before the first feature-length walking-dead film appeared: director Victor Halperin's cheaply made White Zombie (1932). It was the first, feature-length official 'walking dead' zombie film, inspired by Seabrook's book, about a Creole bokor who zombified a white woman (the "white zombie" of the title). The expressionistic entry starred Bela Lugosi as voodoo priest "Murder" Legendre, the piercing-eyed owner of a Haitian sugar mill operated by mindless human zombies. He entered into a perverse pact to control and win the soul of a bride-to-be (Madge Bellamy). The film was deliberately made with minimal dialogue, and filmed to be visually atmospheric and expressionistic. The inspiration for the film was the short-lived 1932 Broadway play titled Zombie by Kenneth Webb. Next came the inferior, slow-moving sequel Revolt of the Zombies (1936), with another preposterous plot, poor acting (from Dean Jagger as a Cambodian sorcerer-priest with a secret formula to create hypnotized zombies), and ineffective direction. The talkative and slow-moving film was overshadowed by a lawsuit about its use of the word 'zombie.' And in the hour-long horror thriller Ouanga (1936) (aka Love Wanga, or Drums of the Jungle), native Haitian plantation owner (and voodoo priestess) Clelie (Fredi Washington) jealously raised two zombies to kidnap the new fiancée (Eve) of her ex-lover Adam (Philip Brandon) and sacrifice her in a ceremony. Three zombie films from "Poverty Row's" Monogram Pictures followed in the next decade, tying Nazism to zombie lore. The pre-war King of the Zombies (1941) told of a crash-landing on a remote Caribbean island where a suspicious and sinister Nazi-like spy/doctor named Miklos Sangre (Henry Victor) lived. He conducted hypnotic voodoo rituals in his underground dungeon and was ready to release a horde of zombies. Its quasi-remake B-film sequel, director Steve Sekely's, Revenge of the Zombies (1943) (aka The Corpse Vanished), starred John Carradine as a mad Nazi scientist building a world-dominating zombie army (a race of "living-dead" warriors for the Nazi's Third Reich) in a Louisiana swamp. This 1943 film was Academy Award-nominated for Best Scoring for a Dramatic Film! [Both films featured African-American character actor Mantan Moreland in a stereotypical role as a bug-eyed manservant - for comic relief.] And Voodoo Man (1944) was a recycled Revenge of the Zombies that brought back Bela Lugosi (for the last and ninth time for a Monogram feature) as practicing voodoo master Dr. Marlowe with John Carradine as a retarded man-servant. Marlowe kidnapped young women to use their will and spirits to animate his dead wife. The next significant zombie film was RKO producer Val Lewton and director Jacques Tourneur's intelligent and spooky B-film masterpiece I Walked With a Zombie (1943), a West Indies derivation of Charlotte Bronte's dark romance Jane Eyre. [Note: Lewton was known for such B-movie classics as Cat People (1942).] The movie's most atmospheric scene was the dreamlike nocturnal walk through the sugar-cane fields to a native voodoo ceremony with the sound of drums and the startling appearance of a giant bug-eyed zombie guard named Carre-four (Darby Jones). The zombie subgenre declined after the mid-forties, although there were a few notable entries in the fifties, such as Republic's twelve-part sci-fi serial, Zombies of the Stratosphere (1952), producer Sam Katzman's Zombies of Mora Tau (1957) with a zombified crew of sailors protecting a sunken treasure vessel, AIP's Voodoo Woman (1957), and the box-office bomb Teenage Zombies (1960). The apocalyptic Italian film The Last Man on Earth (1964, It. ), starring Vincent Price as the sole surviving Dr. Robert Morgan besieged by bloodthirsty vampire-like plague victims, was the first film version of Richard Matheson's 1954 novel, I Am Legend (later remade as The Omega Man (1971) starring Charlton Heston and I Am Legend (2007) - the original title, starring Will Smith). Also, due to the space race with the Soviet Union in the 1950s, some of the curiosity and fear about space (and aliens) infiltrated into "sci-fi" zombie films at the time, postulating that aliens could raise the dead. Two examples were found in the cult films: Invisible Invaders (1959) and director Ed Wood's Plan 9 from Outer Space (1959). In the first film, invisible aliens (that could inhabit corpse bodies and raise them from the dead) threatened to invade and conquer Earth. In Wood's film, extra-terrestrials implemented the title's Plan 9 - to resurrect the Earth's deceased "ghouls" in order to force compliance from humanity. They threatened to use their enslaved "armies of the undead" to overtake the planet. By the mid-sixties, the UK's Hammer Films - a company known for churning out dozens of horror films - entered into the world of zombies with its Plague of the Zombies (1966, UK) (aka The Zombies) by director John Gilling, visualizing the living dead as rotting, reanimated (or undead) corpses. Building upon Lugosi's characterization in 1932, the film told about a wickedly insane nineteenth-century Cornish squire who dreamed up a macabre plot to use ancient voodoo rites to raise plague victims from the dead to become zombies working in his tin mine. The film's best nightmarish sequence was one in which decaying graveyard cadavers dug their way up through the earth to surround the shocked dreamer and clutch at him with clawing dead fingers. Another notable dream image was a realistic zombie decapitation. In the waning years of the sixties, "Master of the Zombie Film" George A. Romero ushered in a revolutionary new horror subgenre of zombie pics. Stephen King praised him for taking the horror "out of Transylvania" and bringing it to modern-day America. Romero's first Dead film, his most notable horror film, Night of the Living Dead (1968), became his calling card. It arrived at the same time as civil unrest, Black Power, student protests, the Vietnam War, fear of nuclear annihilation, and the assassinations of Robert Kennedy and Martin Luther King Jr. - all coupled with the idealistic innocence of the previous year's Summer of Love. This debut film was an influential, milestone 'splatter' zombie film. The ultra-low budget, visceral film was shot in grainy 35 mm black-and-white documentary style with natural lighting and hand-held cameras to accentuate the fear. The amateurish, allegorical film made in just one month showed rotten human corpses walking with outstretched arms and threatening a few trapped and besieged survivors who sought refuge. Zombies were indiscriminate, flesh-eating ghouls (not produced by voodoo rites, or outer space mutants) that returned to life with indiscriminate, ravenous hunger for human flesh. Reportedly, it was thought that the zombies were raised from the dead after exposure to radiation from a returning Venus space probe. The terror came from their relentless attack on innocent fugitive survivors who were hiding in a barricaded farmhouse in rural Pennsylvania to escape being infected by zombie bites. Romero himself defined the zombies as average-Joe "blue-collar monsters," who lumbered stiffly out of their graves (due to the effects of rigor mortis), and had a taste for human flesh. Fire scared off the walking, bloodthirsty cadavers, and they could only be forever stopped by a brain kill - shooting them in the head. Soon, the horror threat was coming from inside the house as well as outside, as there was a struggle for power between a resourceful and calm black Ben (the lead character!) (Duane Jones) and impulsive family man Harry Cooper (Karl Hardman). It also showed violated bodies and families torn apart by the 'living dead' creatures who illustrated how nothing was sacred in contemporary society (an adolescent girl killed her own mother with a garden trowel and then ate her). The film's despairing tone, especially its tragically ironic ending, struck audiences as a true depiction of the lifeless dehumanized society in which people lived. In the film's futile and bleak conclusion, the townsfolk mistakenly shot and killed Ben after his desperate fight for survival. Romero ushered in the modern era of graphically violent and gory zombie pics in the waning years of the 60s decade. Romero's zombies walked very slowly and stiffly in a 'cult of the dead' - unlike later variations or iterations within revisionistic zombie films. Ghosts, ghouls, mummies, or vampires are normally not considered zombies. Generally speaking, zombies (known as "the undead") were mindless, stumbling, cannibalistic creatures that had become reanimated from their dead, rotting, corpse-like state. Romero realized that his archetypal zombie narratives - with extreme blood, violence, and gore - could also provide subtextual commentary on societal themes. He recognized that the epitome of horror can be found in humanity itself. As Romero said, "I also have always liked the monster-within idea. I like the zombies being us." Romero's next film, the gore-filled sequel Dawn of the Dead (1978), further redefined the zombie film with a tale of four survivors who sought refuge from ravenous zombies (and from a gang of post-apocalyptic bikers) in a deserted suburban shopping mall. This was the most profitable of all of Romero’s zombie films and the one that was received most favorably by critics. The satirical film was an indictment of seventies consumerism, as it showed the group looting the mall and living the American Dream in a barricaded storage area, distracted by their material luxuries while undead danger lurked nearby. The biting social satire equated zombies with brainwashed automaton consumers slowly shuffling their way through malls as soothing Muzak played. Why did the zombies congregate there? As one character explained, "Some kind of instinct. Memory of what they used to do. This was an important place in their lives." Romero said in an interview, "I've always felt that the real horror is next door to us, that the scariest monsters are our neighbors." Romero completed his zombie trilogy in the mid-1980s with the claustrophobic tale Day of the Dead (1985) in an era of Reaganite militaristic politics obsessed with science. It told about surviving scientists and military officers who performed sadistic experiments on zombies in a subterranean bunker. Military officers and mad scientists - particularly Logan (Richard Liberty), dubbed Frankenstein - attempted to domesticate and integrate zombies back into society, until the living dead revolted. The film cleverly set the genre on its head again with zombies as misunderstood and oppressed. Day of the Dead was also memorable because it created the first "zombie hero" - named Bub - a human-like zombie character that audiences could feel sympathy for. This third film was regarded as the most dialogue rich and the goriest in the original trilogy. (Its climax was non-stop dismemberment, disembowelment, and beheadings.) Although not well received originally - and the lowest-grossing film of the three - it has since become a cult classic after revisionist thinking. Romero would famously go on to make more zombie flicks, including Land of the Dead (2005), Diary of the Dead (2007), and most recently Survival of the Dead (2009). The fourth film of the Dead series in 2005 was a symbolic class struggle and posited the apocalyptic collapse of human society. Masses of poverty-stricken residents in Pittsburgh were forced to live in the empty, embattled streets. Although protected by mercenaries, society was overrun by undead walkers nicknamed "stenches." Meanwhile, the elite lived in fortified Fiddler's Green, bordered on three sides by rivers and lorded over by a powerful super-capitalist (Dennis Hopper). Although this film was written before the events of 9/11, it was released during the era of the War on Terror. To update its significance, some of the dialogue was revised. (e.g., "We don't negotiate with terrorists.") It wasn't a subtle film, presenting the idea that the zombies - led by the more evolved and intelligent Big Daddy (Eugene Clark) - could be trained to shoot guns, use weapons, and besiege the corrupt city. Zombies were portrayed as more human than the humans: "They're just looking for a place to go." The fifth low-budget film, Diary of the Dead (2007), was considered an updated, 21st-century reimagining of Romero's first film. Romero designed it for the YouTube and media-saturated generation. The entire movie was a film within a film. After discovering a worldwide zombie uprising, film students made The Death of Death, composed of first-person video footage (from surveillance cameras, news footage, digital camcorders, YouTube, cell-phone cameras, etc. ), then uploaded it to the Web with scary music added. Sole survivor Debra (Michelle Morgan) spoke for her dead boyfriend, Jason Creed (Joshua Close), who believed the government lied about the causes of the zombie resurrection and vowed to show the world the truth. The sixth film in Romero's Dead series, Survival of the Dead (2009) was, in effect, a tangential sequel to the fifth film - and a major box-office flop. It still presented the thought-provoking idea that the human race might become zombified if it continued to fight itself. The film's major theme was whether zombies, cared for as loving kinfolk, could co-exist with humans by learning to eat nonhuman flesh. The theme followed the patriarchs of two families (the O'Flynns and Muldoons) who led a deadly Hatfield-McCoy feud on an island over their differing views on co-existence with zombies. The influence of Romero on future zombie films has been phenomenal, and many are imaginative derivatives or mutated examples, including Italian filmmaker Lucio Fulci's notoriously gory Zombi 2 (1979, It. ), and Zombi Holocaust (1980, It.) (aka Zombie 3), one of many copycat Italian zombie movies. Director Sam Raimi contributed a low-budget Evil Dead trilogy (1981, 1987, 1992) with Bruce Campbell as the cult-classic hero Ash clashing against spirit-possessed zombies. Re-Animator (1985), based on H.P. Lovecraft's early-twenties short story, was about reanimation experimenter Herbert West (Jeffrey Combs). There was also the Return of the Living Dead parody series (1985, 1988, 1993, and 2005). Wes Craven's Serpent and the Rainbow (1988) reconnected zombies with their voodoo roots. Director Peter Jackson's landmark Braindead (1992, NZ) (aka Dead Alive) was the bloodiest and grossest zombie film ever made. 28 Days Later... (2002, UK) and 28 Weeks Later (2007, UK) were a pair of films about infected zombies (rabid killers) unleashed by a biohazardous, pathogenic virus that could spread rapidly. And there were five Resident Evil films (2002, 2004, 2007, 2010, and 2012) based upon the original video game. There was a virtual explosion of zombie films - a Zombie Renaissance - in the decade of the 2000s, especially after the successes of Zack Snyder's Dawn of the Dead (2004) and Edgar Wright's Shaun of the Dead (2004, UK). A zombie film revival was in full-swing, mostly borrowing from Romero's earlier films. The zombie film has become one of the most versatile of genres - there has been everything from zombie comedies to zombie science-fiction flicks, zombie thrillers, zombie disaster and apocalyptic films, and even romances involving zombies (such as Jonathan Levine's Warm Bodies (2013)). Sometimes, zombies were also demonically-possessed, or caused by the spread of a deadly virus or plague. World War Z (2013) added the intriguing idea that zombies could work together and coodinate their activities, similar to the behavior of ant colonies. And it was possible - in a post-zombie world, suggested in The Returned (2013), that the infected zombies could be cured (with a retroviral drug) and actually live a normal existence. Since AMC's original TV zombie drama series The Walking Dead made its Halloween 2010 debut (with a short six-episode first season), it has broken numerous basic cable viewership records, and has had multiple seasons on the air. It was based on the comic book series written by Robert Kirkman and published by Image Comics, telling the story of the months and years that followed after a zombie apocalypse. A group of survivors, led by police officer Rick Grimes (Andrew Lincoln), traveled in search of a safe and secure home. Note: As of 2018-2019, AMC's series The Walking Dead was in its 9th season (with 16 episodes), with more seasons and episodes planned for an undetermined amount of time stretching into the future. AMC premiered a companion series known as Fear the Walking Dead to its massive hit series, with a six-episode first season in 2015. The spin-off prequel, set in Los Angeles, followed a different set of characters, with Cliff Curtis and Kim Dickens in the lead roles. As of 2018, the series was in its 4th season with 16 episodes, and was preparing a 5th season for 2019.